The grocery store in Elmvale recently had a super deal on mini roses, $2 per plant. We noticed the deal one night and conservatively bought three. The next night we went back and bought eight more, pretty much buying the remainder of their stock. On the weekend we noticed more roses and impulse bought our twelfth one. The cashier said: "They are such a great deal! And you are only getting one?" We told her we already had eleven at home! We planted most of them outdoors, but we kept a few inside and a red one sits on my desk. I love it! Last week John was out weeding the flowerbeds and cleaning up the backyard and he came back in with a home grown bouquet. 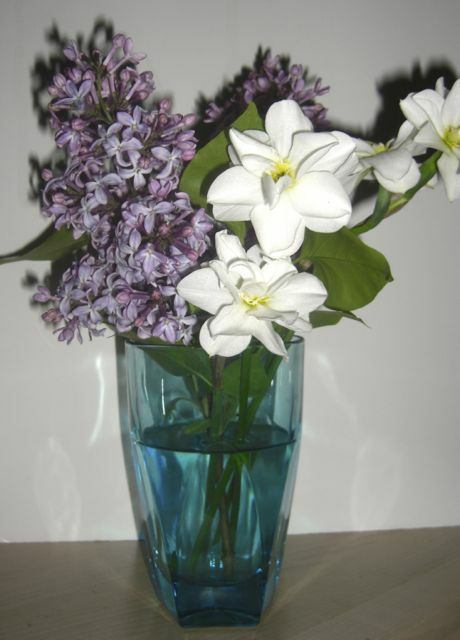 Lilacs and Narcissus made my desk smell great all week, and periodically I put my nose right into the lilac. I love that smell. 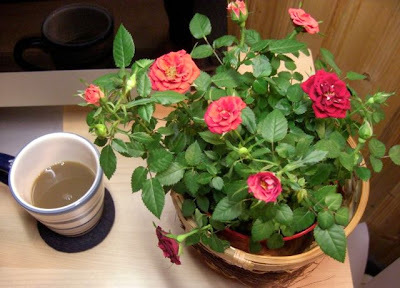 Do you keep any plants or flowers on your desk? If so, what kind? backyard and plant seeds there. I love lilacs too. Such a perfect smell and a pretty colour to boot. All your flowers sound lovely! We planted some roses and I have some perennials that are coming up, and I find it so calming to see them in the backyard. Okay doke. Home from work, showered and ready for our big Friday night. Tim's getting pizza and we're going to clean the house for the weekend.